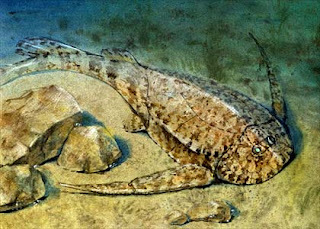 Life Before the Dinosaurs: Bothriolepis. 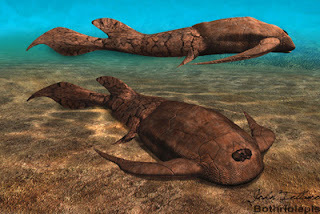 Bothriolepis was the most common placoderm in the Devonian Period. It was about one foot long. Bothriolepis was world-wide. There were 100 species of Bothriolepis. Bothriolepis means "pitted scale" or "trench scale," because Bothriolepis had pits and trenches in its armor. Bothriolepis, like all placoderms, even had its eyes covered with armor. Bothriolepis had its eyes almost touching each other, and looked straight ahead like a person, unlike many other fish, which evolved one eye on either side of the head like a horse. Bothriolepis had armored front fins to push it off the sea floor, because if it tried to swim up, it would immediately fall back down because of the weight of its armor. This image shows Bothriolepis canadensis on the sea floor. Some scientists think that it is possible that Bothriolepis migrated like salmon into fresh water to mate. 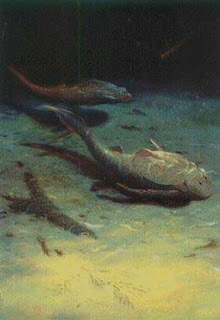 Unlike salmon, Bothriolepis is believed to have spent most if its life in freshwater. The reason why Bothriolepis was so successful is unknown.